– in a tiny village in the inlands of Swedish Lapland. Now it is official. The village Vuollerim is the first in the world to set a Guinness World Record in the category “Largest Ice Lantern Display.” Through immense teamwork, the villagers managed to have 2.651 ice lanterns lit up at the same time in the center of the village Vuollerim in Swedish Lapland. 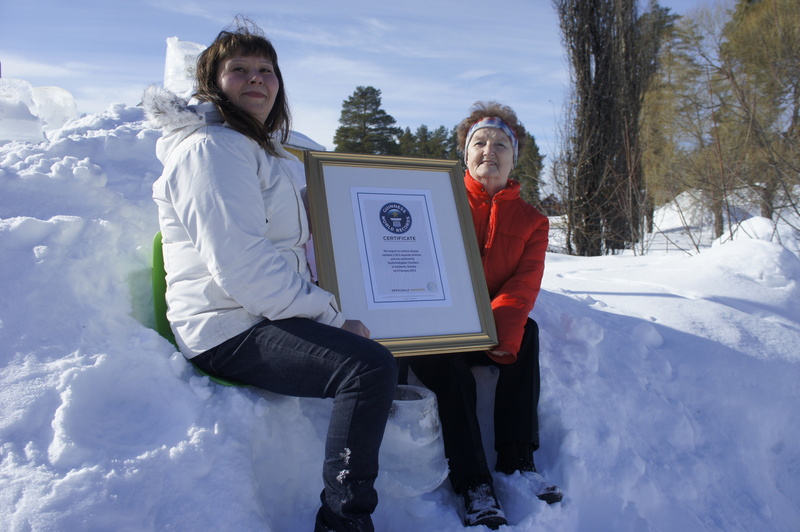 Karina Lindh, who came up with the idea of a World record attempt a few years ago, is so happy that she has a hard time standing still. –This is just awesome, I can’t believe it’s true! Now it’s time to celebrate! Nancy Larsson, who was one of the first villagers who started the tradition of decorating Vuollerim with ice lanterns ten years ago, is also very pleased. –It’s amazing! So many people were involved. It was incredible to see so many people show up and get involved during the World Record’s day. There were those who placed the ice lanterns, others unpacked all the candles, lit candles, and carried them out in buckets. I only recognized half of them, the rest were guests visiting. 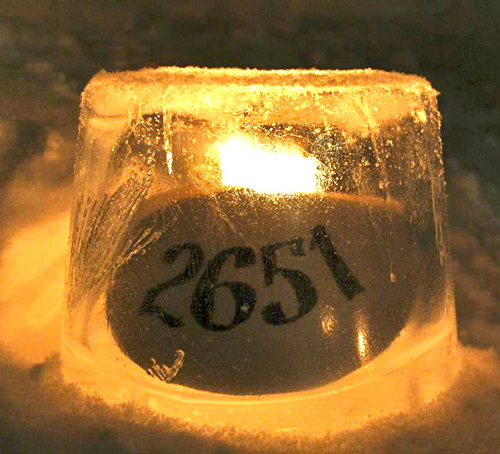 Eva Aronsson visiting from another part of Sweden was one of many people placing the lit candles into the ice lanterns. –I get goose bumps! This is absolutely amazing! And it’s so much fun to be a part of this. Outside of the building that served as a central for lighting all the candles, some Italians had gathered to take pictures. They were all very fascinated by the ice lanterns. A minute later they were invited to join in and started carrying out buckets filled with lit candles. Larry from Canada was climbing on a big pile of snow that had ice lanterns all the way up to the top. Coming straight from a conference about indigenous people’s rights, he was hardly dressed for the task, but that didn’t stop him. –I had absolutely no idea this record was taking place here today. It’s a Beautiful tradition that warms my heart! You could say that to set an official Guinness World Record, you need an entire village. Only a fraction of all the record attempts get awarded. Every week around one thousand attempts are made to break or set an official Guinness World Record and only a few get approved. In addition Guinness requires a great deal of evidence and witness statements in order to come to a decision. A whole binder filled with completed forms, maps of the area, photos and videos were submitted to the Guinness office in London by two young adults from Vuollerim who were visiting London. Vuollerim is a village with approximately 800 residents and many have been involved – one-way or another – to set the record. The two independent and valid judges that counted the ice lanterns for the World record attempt were Mayor Stefan Andersson, municipal councillor of Jokkmokk and Mr. Hans-Olof Wik, a CPA from Boden. A total of 2.651 ice lanterns were lit simultaneously in the official display area and unofficially at least another thousand ice lanterns were lit throughout the entire village. Though they were not included in the count for the record, they sure added to the atmosphere of teamwork and were shining brightly in a magical way. The villagers plan to celebrate the world record in Vuollerims People’s House on April 10. Everyone is Welcome!! !